Stuff Points: Earn 541 points when you buy this stuff. 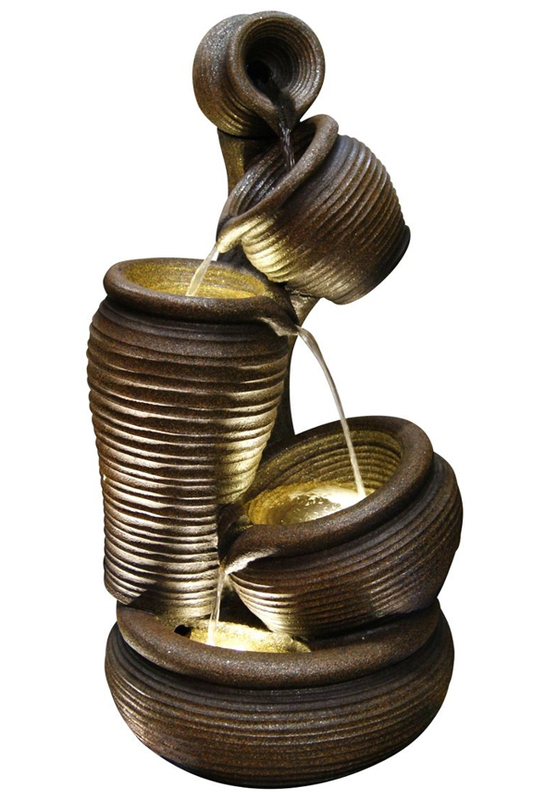 They look like they're falling in space, but each pot is specifically positioned for ideal water flow, and the tall pile creates the perfect water feature for your backyard patio. A large urn creates the base, and four more in various sizes, tip back and forth as they stack up vertically to form the rest of the fountain. Each one features a swirled texture on the exterior to make it look authentic, and the whole thing appears to be hand crafted from a natural material. Instead of clay or stone, this fountain is actually constructed from a poly-resin material that is lightweight and durable, yet able to resemble the real thing. The three lower pots are enhanced with underwater lighting to reveal details on the interior, and illuminate the running water to improve the effect. Once it's filled up, and turned on, water will pump all the way to the top in order to fill the highest pot. A small amount will collect inside, but thanks to horizontal positioning, it will quickly pour out, and fall down into the next pot. This one is a bit more vertical, so more water will remain inside, but once at capacity, the stream will pour out one side to gently drop down into the tall pot next to it. Once that one fills up, a long stream will form to take water into the next pool, and as that one fills, a shorter waterfall will take it down into the lower basin to complete the journey. The included pump will cycle the same water over and over in an endless loop, and it plugs into any regular electrical outlet. This model is perfect for any backyard location, and it's backed by a one year warranty from the manufacturer. Easy Set-Up. This model ships complete with all parts necessary for operation, and it requires little to no assembly. Just fill with water, and plug it in to complete the set up process. Poly-Resin Construction. The durable material looks like the real thing, but it's much lighter, and far less expensive. High Quality. A unique design, and quality construction makes it look awesome, and top quality electronics guarantee it will work as well as it looks. Multiple Tiers.Each pot is higher than the next, and positioned at a different angle. When water flows the interesting path is sure to captivate. Integrated Lights. The three lower pools are lit up by underwater LED lights. Perfect for nighttime ambiance, but also nice any other time due to the sparkling streams, and enhanced details. This model is 40 inches tall, and 20 inches wide on it's longest side. This large fountain is pretty tall, and kind of heavy. Table top placement is not recommended. The tall structure makes a bold focal point that is best placed on the ground outside, or the floor in your home. Whimsical styling makes for a fun decoration that can be used indoors or out. This tall fountain has four lighted tiers for water to flow. Order Yours Today!